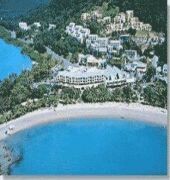 The Airlie Beach Hotel is located in the centre of Airlie Beach and is an impressive stepping stone to the magnificent Whitsunday islands. The Airlie Beach Hotel has the unique advantage of being located on The Esplanade as well as in the main street of town, offering hotel guests the convenience of being located within easy walking distance to the lagoon and the many shops, cafes and restaurants located in the village township of Airlie Beach. The hotel itself provides all the facilities you would expect of a 4 star hotel, including two of Airlie's most popular and award winning restaurants. The focus is on relaxation however there are many activities available to the adventurous. The hotels several room types offer guests a variety of room sizes and bedding configurations.